My January ended, and my February began, with a ten-day trip to Houston. It started with the Halloween Expo, a big trade show for the Halloween industry. Which is far huger than I'd realized, even though I'm a big Halloween fan. We had never gone before, but the theory was "We have some zombie games . . . and we have a fuzzy tentacle . . . surely Halloween stores cannot survive without these things . . ."
We learned a lot at the show, and one lesson is that Halloween stores can probably survive indefinitely without dice games or even fuzzy tentacles. It's a big, big business, and most of it is in costumes. But some of the buyers were a tiny bit intrigued by what we had to offer, so maybe, just maybe . . .
We also saw about three different things at the show that might make good promo items, so even if we never sell a thing to the Halloween stores, it wasn't a wasted trip. But (a) I think we will find a market, at least for Zombie Dice, and (b) time spent in recon is never wasted. After the Expo, Phil came back to Austin. 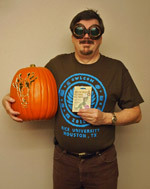 I stayed in Houston for Owlcon. I always have fun there. This time, I not only got to play a lot of Munchkin and Cthulhu Dice, but I got a session in a Battletech pod, courtesy of Tiffany at Roll2Play. The Houston MIBs were great, as always. And it was nice to walk around the campus. A lot has changed in 35 years. The photo is an attempt to capture the whole trip in one shot. If it's strange, well, so was the trip. 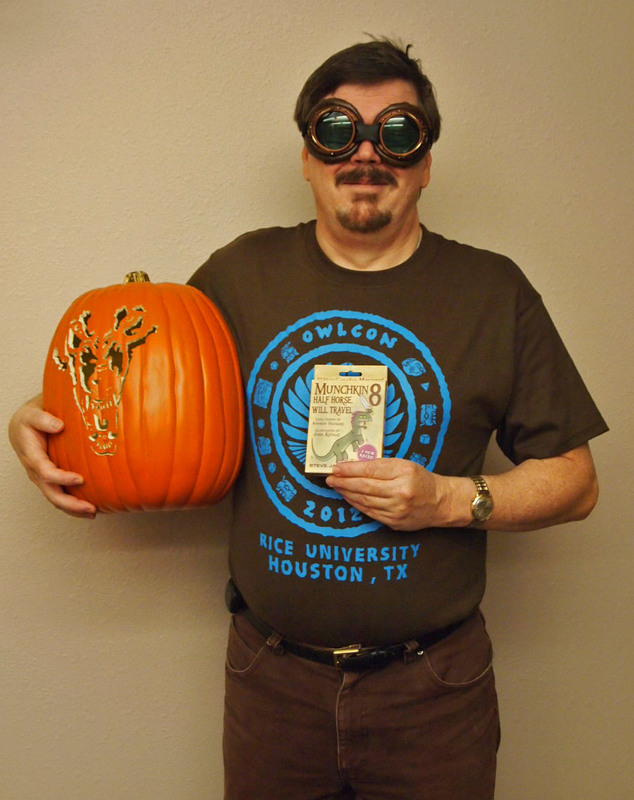 That's me in an Owlcon shirt, wearing a pair of steampunk goggles from the Munchkin fans at Elope. (Plug: one of the bigger costume companies, with a lot of very spiffy stuff. The text on the goggles' hanger card shows they really get steampunk. "Whether you are modulating your steam engine or battling evil Victorian barons piloting larger-than-life mechanical beasts . . ." End plug. I like these people.) The copy of Half Horse, Will Travel is because I was showing it off there. So you should come to Owlcon, and see stuff a month before we release it. I'm just saying. And the pumpkin? That was a Halloween Expo gift from the folks in the next booth, a startup company named Pumpkin WoW. They have improved the noble art of pumpkin carving . . . and this was their first finished display model ever . . . and it's an artificial pumpkin, so I can put it up every year, and I will. Thanks, guys!